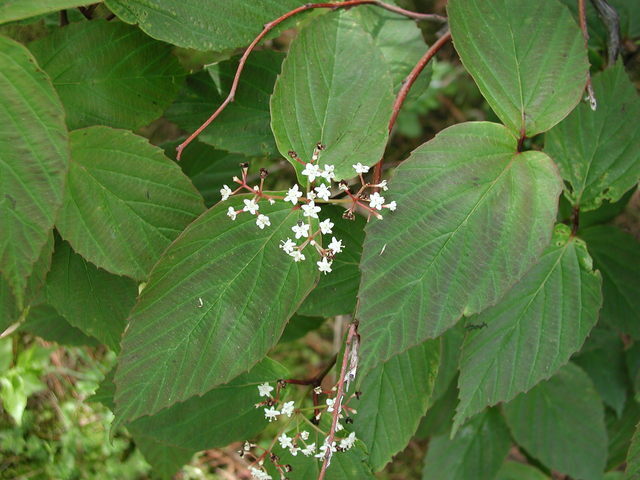 Viburnum sieboldii.©Les Mehrhoff.www.discoverlife.org (Accessed 8/2014). Viburnum setigerum is a shrub to 4 m tall; multi-stemmed, erect. Leaves opposite, 7-15 cm long, 3-6 cm wide, tip long pointed, base round to slightly lobed, dull blue-green, margin toothed. Flowers white, in flat-topped clusters to 5 cm wide; blooms May. Fruit bright red, fleshy, about 0.8 cm. Habitat: Escaped from cultivation or an over grow horticultural specimen.